A unique custom made serie has been made with the rare gem Ammolite. It is the masterpiece Real Moon Stella Nebula, made in collaboration with Stella Polare in Tokyo, Japan. 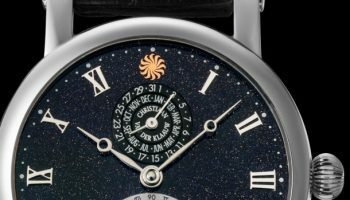 Stella Polare is dedicated to sourcing the finest and most exclusive pieces from leading independent watch and clock makers in the world who can only be described as Horological Artists. What is Ammolite? The World Jewellery Confederation classifies ammolite as a true gem, one of only three named in the last 300 years. Ammolite originates from prehistoric marine fossils that date back 71-million years. Tectonic pressure, heat and mineralization formed the gemstone. The luminous color in each gem is unique and therefore no two Ammolite pieces are the same. Multiple layers of the natural gemstone material create a beautiful array of color. These rare ammolite gemstones are discovered and hand cut to maximize the inherently bright colors by Korite, leader in the ammolite industry since 1979. 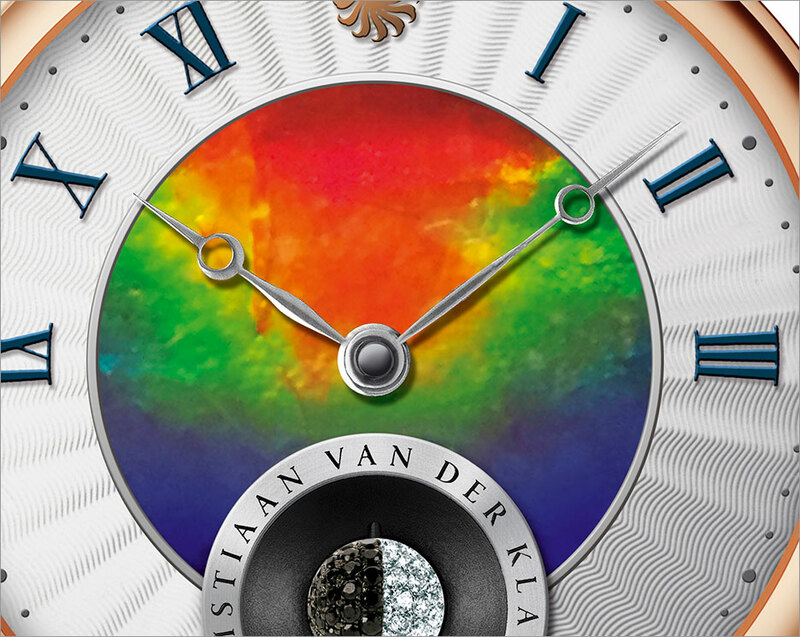 The CVDK Real Moon Stella Nebula carries our iconic rotating 3-dimensional real moon indicating the true moon phase. 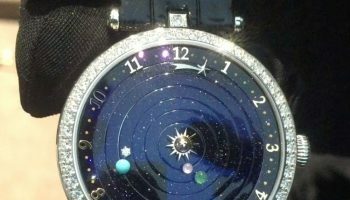 It is custom made out of white and black diamonds. The moon rotates around the earth every 29,5305889 days. Our hand-made 3D miniature moon indicates the moon phase so accurately that it deviates only one day in 11,000 years. 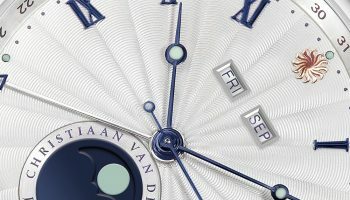 It is the most accurate 3D moon phase indicator ever incorporated in a mechanical watch movement. Reference: CKSP1194 • Movement: CVDK7382, automatic winding, 35 jewels, twin barrel, power-reserve; 96 hour max. • complication; CVDK Real Moon Joure module. 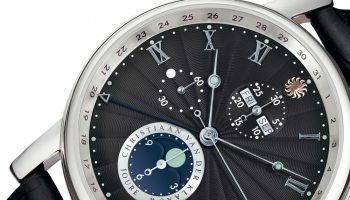 • Functions: Hours, minutes, complication; 3D moon phase; the watch is equipped with the most accurate 3D moon phase in the world. • Custom made with white and black diamonds. • Case: Rose gold, ø 40 mm, sapphire crystal, sapphire crystal case-back. 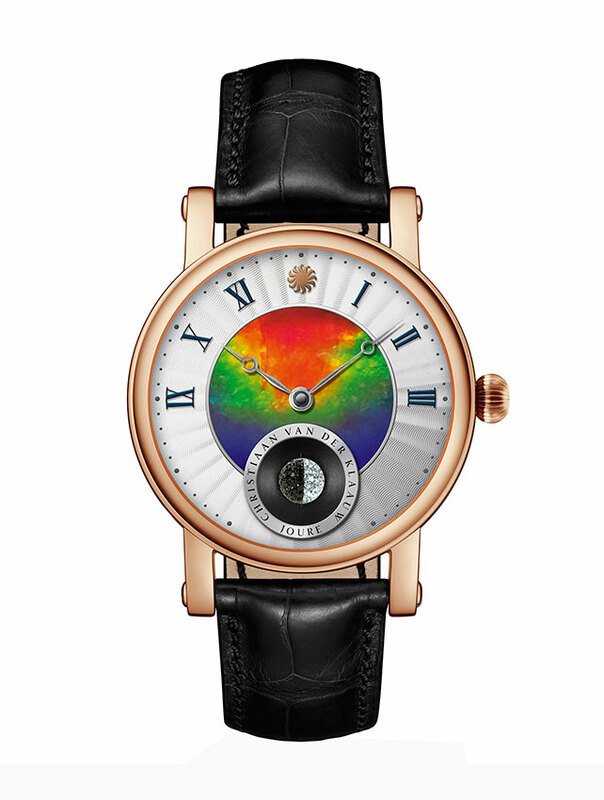 • Dial: Silver with blue indexes, ammolite. • Strap: Black alligator leather. • Buckle: Logo engraved rose gold buckle. For more information visit the Christiaan van der Klaauw website.